After More 'Yellow Vest' Protests, France's President Macron To Address Nation Much of the movement's popular anger has crystallized around President Emmanuel Macron, seen as arrogant and out of touch. He will make a televised address Monday evening to try to quell the crisis. 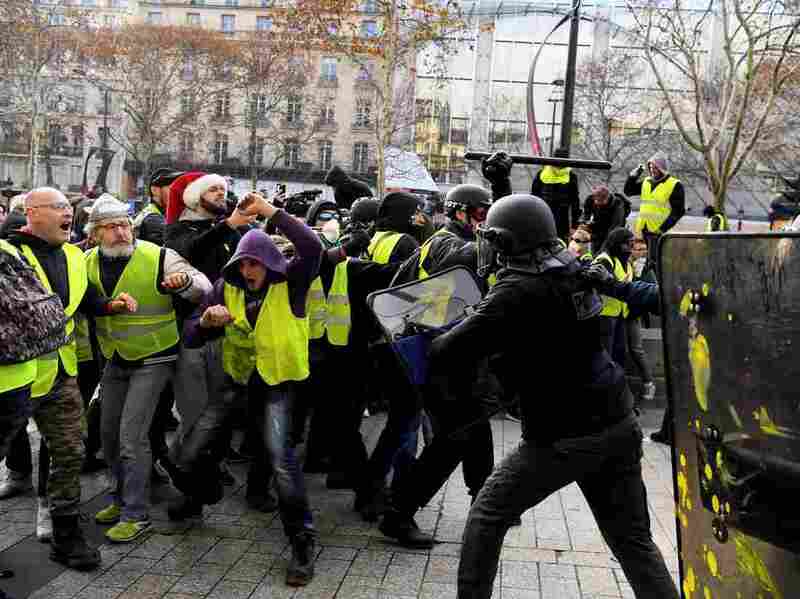 Yellow vest protesters face off against police in Paris on Saturday. The French government is hoping Saturday's "yellow vest" protests were the last. The movement, named for the fluorescent safety vests worn by demonstrators, is not only the country's biggest social and political crisis in 50 years, but, according to many analysts, a very threat to French democracy. Prime Minister Edouard Philippe has called for national unity and said, "It's time to stop the fighting and begin the dialogue." Much of the popular anger has crystallized around French President Emmanuel Macron, whose critics see him as arrogant and out of touch. Macron must prove he has heard, understands and will address people's anger if he wants to bring an end to four weeks of protests and chaos brought on by the movement. Ahead of his televised address to the nation Monday evening, the president has been meeting with unions, employers' organizations and local elected officials to try to find answers to the crisis. Who Are France's Yellow Vest Protesters, And What Do They Want? "We are ready to make any gesture" that works, French Finance Minister Bruno Le Maire told RTL radio on Monday. "What is important now is to put an end to the crisis and find peace and unity in the country again." Protesters set up camp at a traffic circle near Lille, in northern France. Just a few months ago, it appeared that Macron was on track to change the country. He had faced down the unions as he overhauled the notoriously rigid labor code. And he was about to take on reforming the country's retirement system. Then the yellow vest movement rose up from the heartland. This weekend's protests were less violent than the previous week's, partly because there were double the number of police on the ground. When the day was done, more than 1,700 people had been arrested across France. Hundreds were eventually let go without charges. But the government wanted to avoid the kinds of scenes that played out the previous week, when riot police were pinned down by groups of protesters hurling stones and Molotov cocktails. The white, working-class yellow vest movement began in mid-November, in reaction to a new tax to be levied on diesel fuel and gasoline to help finance France's transition to a greener economy. In the face of the protests, the government canceled the tax last week. The movement has no leaders or union backing. And Macron's government — as well as most of the political class — never saw it coming. But out on the streets, protesters say anger has long been rising. Marie Noelle Santier, who drove to Paris from Brittany to protest on Saturday, brought along her two little boys. They were splashing around in puddles and chanting "Macron get out!" Santier, wearing a red Phrygian cap, a symbol of the French revolution, lives in the countryside and says she is completely dependent on her car. "Any job I take is at least 25 miles away," she says. Santier earns minimum wage and says she spends nearly half her salary getting to and from her job. "I can't even afford to buy shoes for my kids," she says. "We can't let things go on like this anymore. The anger has been rising for nearly 40 years. I understand the violence because people are so fed up. You push them a little more and they explode." Santier calls what's happening a "people's insurrection" and a "revolution." 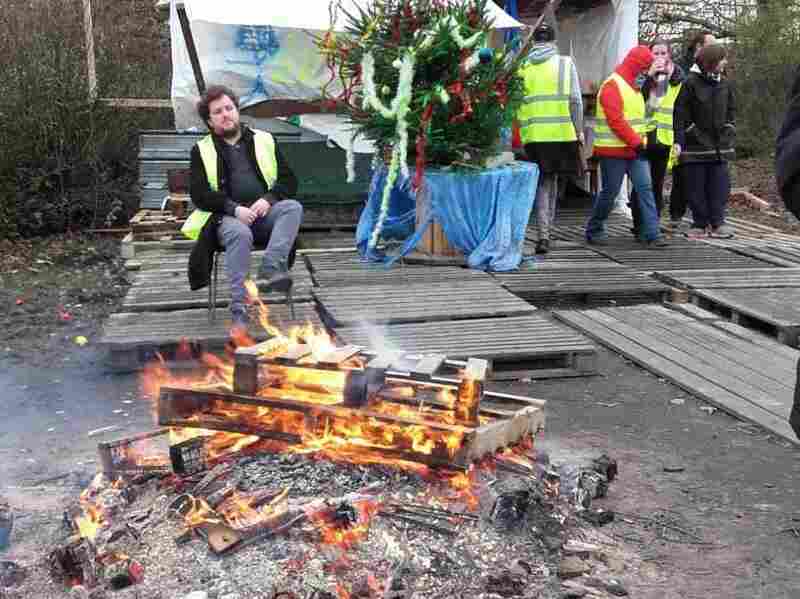 "We feel more and more boxed in"
A three-hour drive north of Paris, in the middle of a traffic circle on a rural highway near Lille, a group of jovial yellow vest protesters has set up a little camp. They've built a lean-to from scrap wood and a tarp. Thanks to the generosity of passing drivers, they're stocked with sausages, chips and wine. Drivers in cars and trucks honk their horns in support and some pull over to chat. Corinne Ryckaert, 45 and a mother of two, says everybody here depends on their cars. "We feel more and more boxed in," she says. "Gas is going up, and highway tolls are going up. If you avoid the highway and take the back roads, you end up using more gas or you get a ticket for speeding because they've lowered the speed limit, so no matter what you do, you pay." No one can afford to buy a new car, she says. Many drive older diesel vehicles and they say the new inspection standards can also mean expensive tuneups. "We feel like we're back in the Middle Ages and we're paying the [feudal] lord to live on his land," says Ryckaert. Like most of the protesters, Ryckaert is angry about Macron dropping a tax on the super-wealthy, known as the impot sur la fortune or ISF. "Macron is a president of the very rich," she says. "He got rid of the ISF for the most well-off in France ... And now the government tells the little people it's up to them to pay a tax for the ecology." Ryckaert says they're all for saving the planet, but not on the backs of the poor. Scrapping the wealth tax was one of Macron's campaign promises. He may now be forced to reinstate it. "'Boss' is a dirty word"
On Paris' Avenue de la Grande Armée, Thierry Stapts was boarding up his store windows ahead of Saturday's demonstration. Stapts owns three shops and sells high-end motorcycles and their accessories. One of his stores was ransacked and looted the previous week — he didn't want to risk that again. Stapts believes if Macron reinstates the wealth tax, it could force some investors out of France. "If you don't have investors, you don't have business," he says. "And if you don't have business, you don't have work. It's very simple." He says the strikes and protests are always about the same thing: rich vs. poor. But he says it doesn't reflect reality, because it leaves out people like him in the middle class. "I'm not rich," he says, "but they think I am because I'm a boss. 'Boss' is a dirty word in France." Still, Stapts says he understands the yellow vest anger and thinks that Macron has handled the crisis poorly. He scoffs at the idea of telling people who are barely scraping by they have to pay an ecology tax. Stapts says there are too many taxes in France. At the demonstration on Saturday, Patrice Hubert, wearing jogging shorts, is not protesting but says he's brought his 12-year-old son to see his country. "I wanted to show him what's happening in France with the deep population," says Hubert, a resident of an affluent neighborhood. He believes Macron has lost control of the crisis. "I think he has completely lost any link he might have had with the people," says Hubert. "I don't think he can recover it." "France is a rich country and we have very talented people," he says. "I'm sure we can rebound."